Today, is the last day of our Italian summer herbs giveaway and what better way to finish than with a delicious recipe with one of the most popular Italian herbs, parsley? 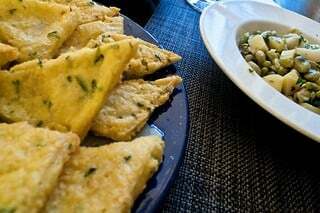 Panelle with parsley is a typical Sicilian recipe. Mix the chick-pea flour into the water, making sure there are no lumps. Add a pinch of salt or two and a small clump of finely chopped parsley. Mix well and then start to heat on a low flame until the mixture turns into a thick, almost solid mass. Then, pour the mixture into a baking tray and let it rest a while to cool. The thickness should be about 3-4 mm. Once the mixture has totally cooled and turned to a soft solid state, cut into rectangles (about 7cm x 4cm). Heat a decent amount of extra virgin olive oil in a frying pan, add a bit of salt and then fry your panelle rectangles until they become golden brown. Place on kitchen roll paper to get rid of any excess oil and then put a few in a crusty bread roll. Add some fresh lemon juice and eat while hot. Try this recipe and you’ll definitely be tempted to join us on a cooking holiday in Sicily to learn more about local cuisine.